xCORE-AUDIO Hi-Res processors offer high-resolution audio interfacing capabilities to deliver precise output with low noise/distortion for soothing, high-quality sound at a price-point that is affordable for mass-market consumer audio applications. xCORE-AUDIO Hi-Res processors support the full range of Hi-Resolution file formats, including PCM audio encoded at 384kHz/32-bit and DSD 2.8 MHz/5.6 MHz audio using any PC or MAC. The built-in USB interface supports a wide array of digital devices, including iPod®/iPhone®/iPad®1 devices, PC or Mac®. 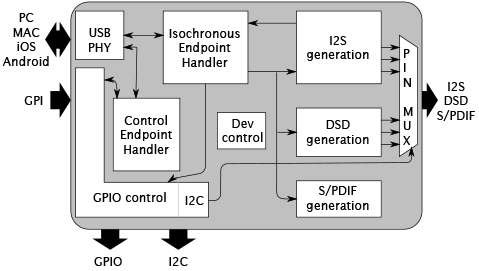 GPIO are available for implementing Human Machine Interfaces (HMI) and/or the control of external audio ADC/DAC devices. xCORE-AUDIO Hi-Res is available in easy-to-use 64-pin TQFP packaging for low-cost system integration.